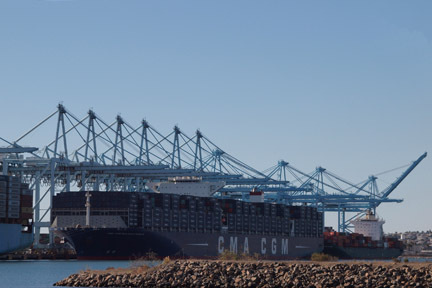 Just before dawn this morning, the largest vessel to ever touch an American shore, coasted into the Port of Los Angeles. 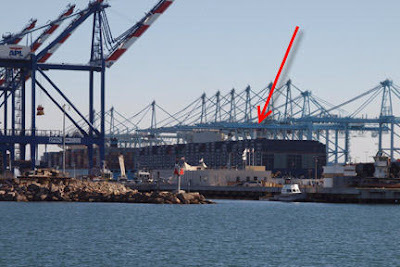 At first glance, from a distance, it appeared to be part of a building. 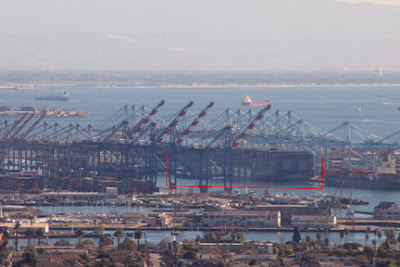 From the recommend viewing location (Japanese American Fishing Village Memorial on Terminal Island) it was at an extreme angle that dwarfed its size. Going in for a closer look we headed over to Berth 401; from the road, the entire ship could be viewed but still from an angle that diminished the impact of its size.